The “Export file” is opened when you try to save a file in a format which does not support several layers or transparency. 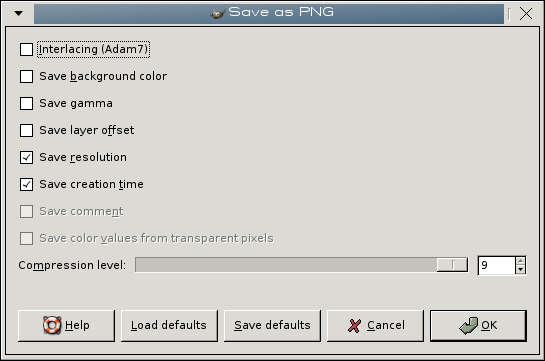 The PNG format, a lossless format, supports transparency but doesn't support animation. So, you only can Flatten image, i.e merge layers into a single one, according to the mode you have selected for the image. 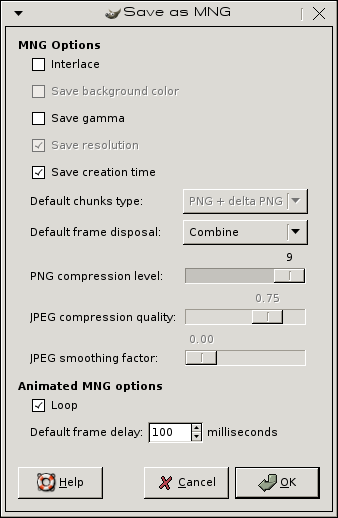 The JPEG format, a compression format with loss, doesn't support animation nor transparency. The file will be flattened and transparency will be replaced with the background color of Toolbox. The MNG format, an animation format, supports 256 transparency levels, which, unfortunately, are not recognized by Internet Explorer 6. The dialog offers two options. Select Save as animation. The other option, Flatten Image has no sense here. and, for that matter, an image which is saved so is not recognized by GIMP. The GIF format, less sophisticated than the MNG format, supports 256 colors and 2 transparency levels only. But it will keep on being used as long as Internet Explorer doesn't support 256 transparency levels. The dialog offers you either Flatten Image or Save as animation. 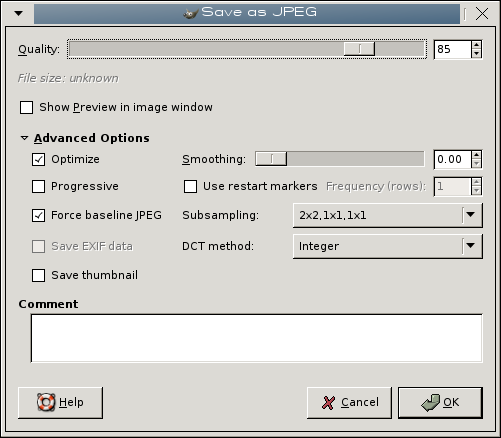 See Save as GIF in Glossary. 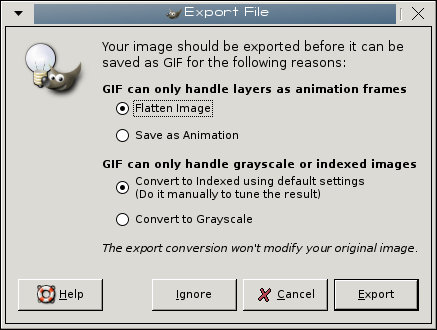 If you have not transformed your image into a 256 colors indexed image before, this dialog will ask you choose between Convert to grayscale and Convert to indexed using default settings. Be careful: an indexed image ungoes a severe loss of colors and the added palette can give it a size bigger and a quality less than if it was saved as JPEG.